Traditionally, Hutterites lived in apartments containing numerous dwellings; in present times duplexes are the norm. Housing Photo by: Kelly Hofer Traditionally, Hutterites lived in apartments containing numerous dwellings; in present times duplexes are the norm. Landscaping Driveway Photo by: Lisa Waldner Both young and old lend a hand when help is needed. Taking our Dolls for a Stroll Photo by: Lisa Waldner Life as a Hutterite child means you'll never be lonely, as there's always someone around to play with. Flower Garden Photo by: Lenita Waldner Flower gardens are rewarding for both the observer and gardener: the beauty of nature is appreciated, while the therapeutic effect of gardening benefits the gardener. Her Front Lawn Photo by: Lisa Waldner Personality and creativity, as in this young women's front yard, can be found in many aspects of community life. 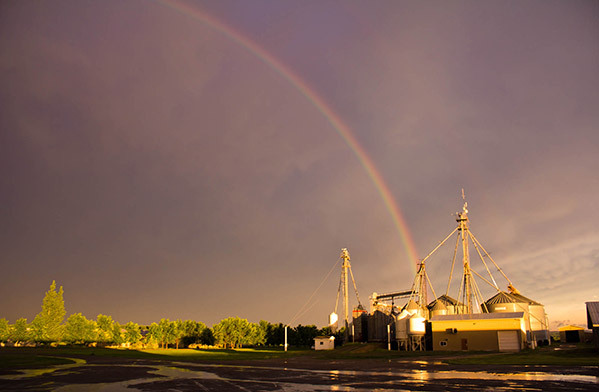 Feedmill Photo by: Kelly Hofer Many Hutterite colonies grow and mix feed for their livestock.